Using plants for decorating indoors was a really big trend in the 70s and in recent years it has regained popularity. Whether you are decorating your home or office space, the interior design possibilities with plants are essentially limitless. Plants will not only aesthetically enhance their surroundings, but they will also improve air quality and the overall atmosphere of any room. Las Vegas is not known for being good with water, and it’s very difficult to maintain a lush green lawn. In fact, the Las Vegas Water District urges homeowners to stay away from from any kind of outdoor landscaping and asks residents to decorate their lawns with boulders, decorative stones or artificial turf. That means that plant design trends for Las Vegas need to be confined to indoor spaces such as your home or office. Las Vegas is a desert where drought is common and residents know they need to be water smart. Just because you live in the desert though, shouldn’t mean that you have to completely give up greenery. This is where the wonderful concept of interior decorating with plants comes to the rescue. There are many indoor plants that require little attention and little water to survive. These plants are perfect for the ever-dry and hot Las Vegas desert. Plant design trends for Las Vegas homes and offices range from classy potted plants, succulents that adhere to the desert culture, vertical gardens to create a lush atmosphere and fragrant and exotic orchids that add beauty and elegance to every space. Succulents are characterized as being thick and fleshy, because they retain water in dry climates. They usually store water in their leaves and stems and they are grown as decorative plants because of their unique and striking appearance.Succulents are perfect for Las Vegas homes or offices, because they are always in style, require little water and attention and they look stunning planted alone or in groups. Succulents vary in style and color ranging from blue-green, pink, red, white and more. Succulent leaves may be rounded, needlelike or spiky. Ferns are houseplants that require little care, thrive on low-light conditions and add to the aesthetics of any space. These plants are easy to grow, but they do prefer to stay moist and they like more humid conditions. Why are these plants so popular for Las Vegas homes and offices? Las Vegas homes and buildings are always kept cool due to the high temperatures, so this makes indoor spaces perfect for ferns. Mist the leaves with a spray bottle and give them a little water to keep the soil moist and these lovely plants will thrive. Terrariums are small, fascinating worlds that perfectly grace your desk, dining room table or other well-lit spot. When you can’t plant outside in Las Vegas, the best solution is to create an attractive terrarium that you can either hang or place around the office or home. Terrariums do need water, but because they are enclosed in containers this creates a humid environment that keeps them moist. You only need to water these indoor plants when the soil becomes completely dry. Vertical Gardens are a trend that seems to be all the rage these days and quickly gaining popularity. These beautiful wall arrangements save on space, highlight a room and significantly improve the air quality of a space. 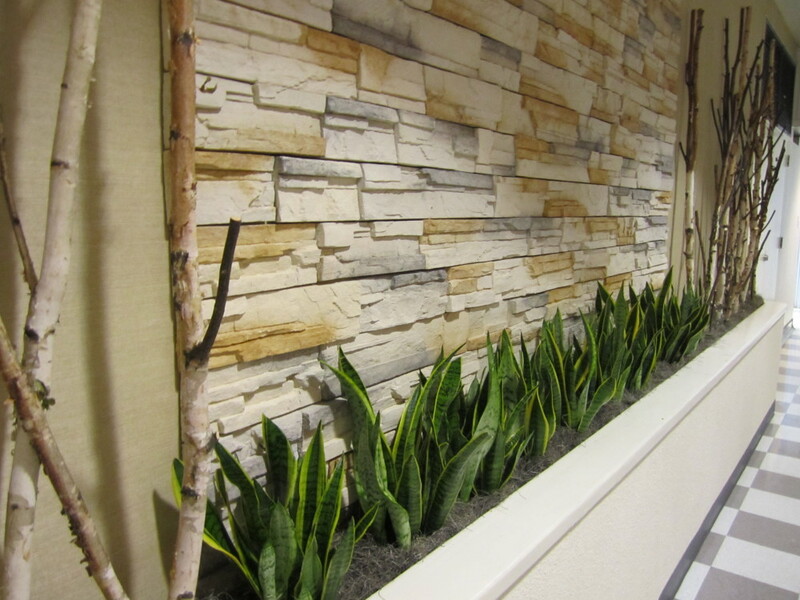 A live wall of beautiful greenery will add a unique and beautiful accent to your home or office. The beauty of vertical gardens is that you can choose different plants that have similar care requirements and group them together. Succulents or ferns are perfect for vertical gardens since they need little water and they live long. Vertical gardens should be placed in a focal area that receives plenty of light. Orchids are unique and attractive flowers known for their beauty and symbolism of love. Many people believe that orchids are hard to care for, but this is simply not true. Orchids are just different, and you need to know how to care for them. Orchids are epiphytes, which means they do not grow in soil but in the air. In tropical environments, the roots of the flower attach to trees or rocks so they can capture moisture and nutrients. Orchids need to be watered effectively so the bark absorbs the moisture and keeps them healthy and beautiful. Placing a flowering orchid on your coffee table at home, or in the reception area of your office will draw the eyes of everyone who steps into the space. All flowers and plants need water to survive, but not every species of plant needs to be drowned in water to survive. Given the dry climate and nature of the Las Vegas area, those who wish to decorate their homes or offices with plants need to look for species that require little water so they can conserve the precious element. Need Plant Design Help for Your Home or Office? If you have any questions about plant design trends for Las Vegas homes or offices, or if you would like a professional consultation with the experts at Interior Gardens, give us a call today. We look forward to sharing our knowledge and expertise with you and helping you pick the perfect plants for your space!